Barbara Britt has a passion for making a difference in the lives of others. She developed the largest leadership program in the country for high school students and spent 16 years working with that program. She is now using that experience and expertise in the corporate world. As a sought after member of John C. Maxwell’s international speaking, training and coaching team, she conducts leadership, personal and professional development training for a variety of organizations. Barbara’s no-nonsense style helps take companies to a new level of growth. ​As an executive coach to management teams and entrepreneurs, and a life coach to individuals, Barbara helps redefine her client’s purpose, vision and goals. She speaks & trains on many different topics based on individual or company needs. Topics include Personality Work Styles, Excellence in Customer Service, and Power Networking. She also has developed a Roadmap for College Preparation Program that is helping parents and their children prepare financially, academically, and emotionally for one of the most important times in their family’s life. She provides results-based insights and can show you where your leadership style is effecting your bottom line. She is a sought after member of John C. Maxwell’s international speaking, training and coaching team. She specializes in developing emotional intelligence and conscious awareness. Her no-nonsense style helps take companies to a new level of growth. 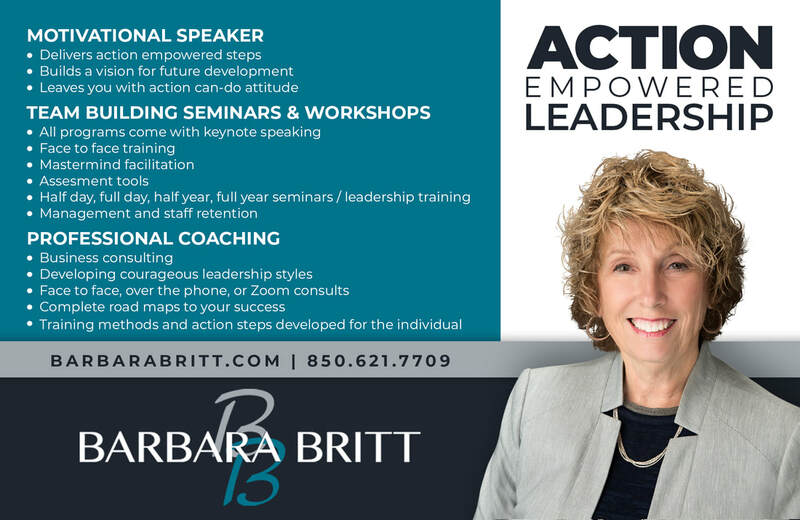 As a sought-after member of John C. Maxwell's international speaking, training, and coaching team, Barbara Britt conducts leadership, personal and professional development training for a variety of organizations. Her no-nonsense style helps take companies to a new level of growth.